Manchester United have shown their class by congratulating Manchester City on Twitter for winning their third Premier League title. 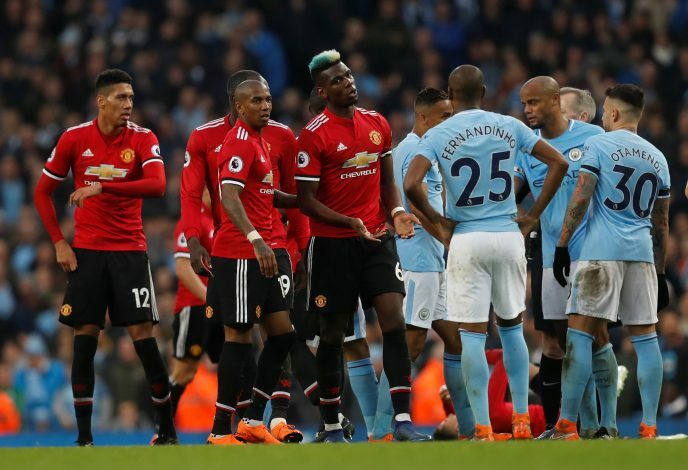 Although United have had a decent season and have beaten every single team, including City, at least once in the Premier League, their cross-town rivals have been more consistent. That consistency, which saw them go on a remarkable 30-match unbeaten run that wasn’t ended until January this year, has been the deciding factor and the most crucial aspect in them securing the title this season. They have been a class above during this campaign, and have won the title with a massive 16-point lead over second placed United. What would have been most disappointing for the Old Trafford outfit is the fact that it was them that handed their ‘noisy neighbours’ the title instead of making them wait even longer for it. City had beaten Spurs 3-1, and United, who faced bottom-of-the-table side West Brom, needed a win to delay the title celebrations by a further week. However, they put up a woeful performance at home to the Premier League’s ‘basement boys,’ and Jay Rodriguez’s 73rd-minute strike condemned them to a shock 1-0 defeat that gifted City the title. It was undoubtedly an embarrassing result, but United still showed their class and congratulated City on their title win with a short, yet very respectable post on Twitter.